Master Bill Jones Tae Kwon Do Academy is a reputable center for martial arts instruction in Concord, CA. Grandmaster Bill Jones personally teaches all of his taekwondo courses, so you get one-on-one training at all times. It pays to train under a taekwondo Grand Master with exceptional skills, knowledge, and accomplishments. Received more than 100 awards and commendations’. Our taekwondo Grand Master has been inducted 17 times. In different hall of fames all around the world. 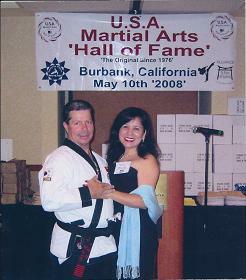 He has over 54 years of experience and has been teaching martial arts since 1976. He has studied over 14 different styles of martial arts and holds 8 separate black belts, 4 master degrees, 9th degree Grand Master, and 2 PH.D. in Martial Arts Philosophy & Science. Call Master Bill Jones Tae Kwon Do Academy to learn more about the taekwondo courses we offer, and get hands-on instruction from our distinguished Grand Master himself.